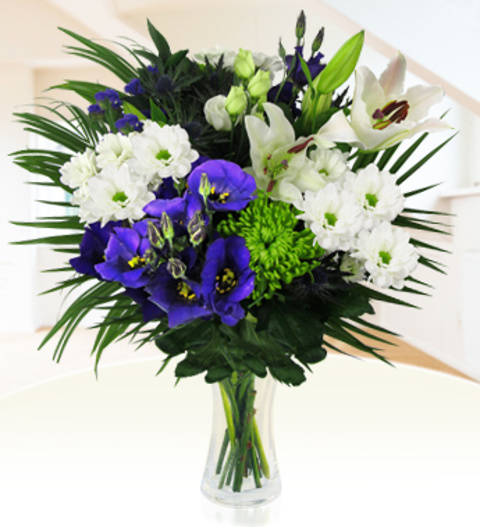 A delightful bouquet arranged with long stemmed lilies, anastasia complemented with seasonal blue and white blooms. Blue Horizon is a customer favourite and is perfect for all occasions. Each bouquet is skilfully arranged by one of our talented British florists and hand delivered to your recipient. The bouquet is beautifully wrapped in stylish gift wrap, guaranteed to bring that wow factor. A gorgeous bouquet that is perfect for all occasions. Order our Blue Horizon bouquet for delivery today! Order by 3pm for same day delivery.